Experiment with the art of making candy, and learn the science behind how it forms and why it tastes so good! This scientific candy wonderland contains all the tools and recipes you need to make and wrap awesome candy. Learn about the chemistry of sugar and the biology of taste!! Read about the history of candy and the candy industry, and discover the origins of chocolate and sugar!! 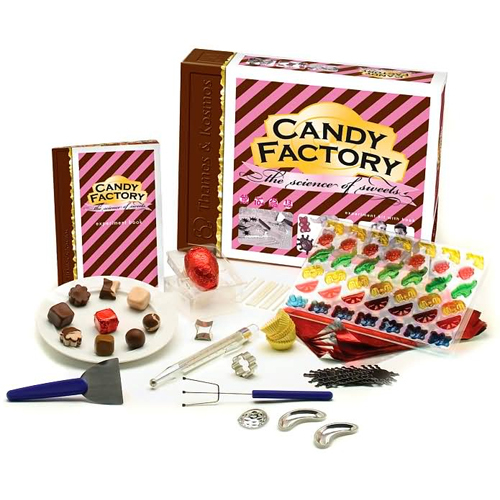 And get down to business and make some lollipops, chocolate caramels, licorice, peppermint patties, and much, much more!! Includes a 48-page instruction book with interesting illustrations, instructions, recipes and scientific explanations.